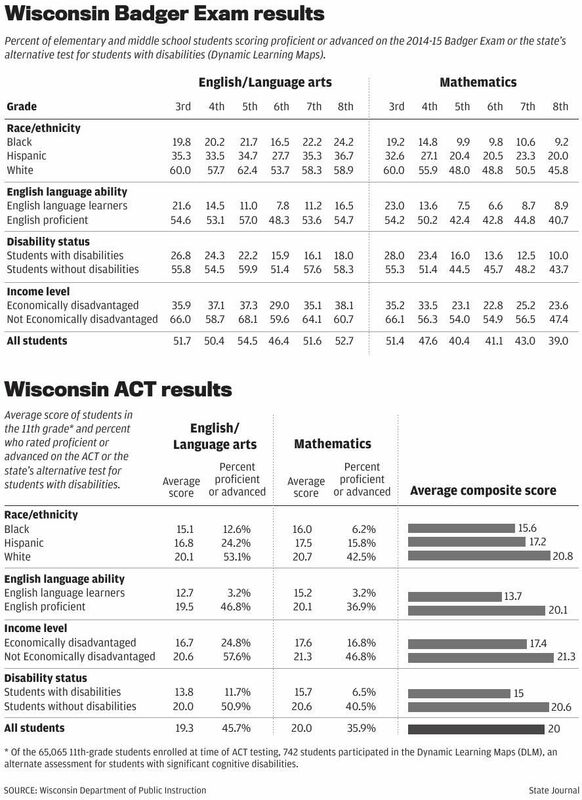 Wisconsin education officials released results Wednesday from the beleaguered Badger Exam, the one-off state standardized test given for the first and final time last spring. The results showed that 51.2 percent of public school students in grades three through eight were proficient or advanced in English language arts and fewer than half, 43.7 percent, were proficient or advanced in math, according to the state Department of Public Instruction. Whether to cheer or bewail those numbers is more subjective than ever this year. Comparisons with the previous Wisconsin Knowledge and Concepts Examination (WKCE) are not possible because of significant differences between the two tests, DPI said. And because of the Badger Exam’s fleeting existence, students’ performance on future tests cannot be measured against this year’s results. That’s left local school district officials to ponder how much significance to give the scores. The results still are helpful, she and others said, but as one data point on a continuum of assessment results. Simultaneously Wednesday, state officials released the results of last year’s first-ever testing of nearly all high school juniors on the ACT college admissions exam. The statewide composite score was 20, out of a possible 36. For instance, while 60 percent of white third-graders tested proficient or advanced in English language arts, the comparable figures were 19.8 percent for black students and 35.3 percent for Hispanic students. Economically disadvantaged students had a composite ACT score of 17.4, compared to 21.3 for those students who are not economically disadvantaged. The Badger Exam was built around the controversial Common Core national academic standards by a group of states called the Smarter Balanced Assessment Consortium. Wisconsin leaders began to sour on the test due to significant cost overruns and technical glitches that delayed its administration and diminished some of its trumpeted attributes. Gov. Scott Walker, in his biennial budget proposal last year, stripped funding for the test. Its replacement, to be called the Wisconsin Forward Exam, will align to state academic standards, of which the Common Core standards are a part. But it is being developed by a different vendor and will no longer be associated with the Smarter Balanced consortium. That means that this spring, Wisconsin students will take a different state exam for the third time in three years. It’s not an ideal scenario, as any new test comes with an understanding that the first year may have some bugs, said Andrew Statz, executive director of accountability for the Madison School District. There can be technical problems, he said, and students need some time to become familiar with a new test’s approach and format. “When a test is brand new, you really do take that into account when looking at results,” Statz said. For that reason, districts tend not to make sweeping curriculum changes or establish new performance goals based on first-year scores, he said. Statz said the district’s internal testing through the Measures of Academic Progress test, or MAP, remains the primary, consistent way Madison tracks student academic growth over time. As for this year’s Badger Exam results, “I’d file it under, ‘Good to know. Thanks,’” he said. Last spring, 367,327 students statewide took either the Badger Exam or the new Dynamic Learning Maps exam, which measures the academic progress of students with significant cognitive disabilities. The scores reported by DPI include results from both tests. More than 700 students, or about 7 percent, of elementary and middle school students in Madison opted out of taking the tests, compared to about 2 percent statewide. DPI officials say the Badger Exam has value in that it is the first to measure how well students are meeting the new academic standards the state adopted in 2010. The Badger Exam broke new ground in other ways, too. It was completely computer-based, replacing pencil-and-paper exams, and it was more dynamic, incorporating short writing responses and interactive elements. Prior tests relied mostly on multiple-choice questions. Paulisse, with the Middleton-Cross Plains School District, said many teachers and students preferred it over the WKCE. “They found the format and type of activities more interesting and engaging, and we thought the questions better addressed our curriculum and the state’s standards,” she said. The Badger Exam initially was intended to be adaptive — or able to adjust the difficulty of the questions based on how the test taker answered previous questions — but that element later was dropped because it wasn’t ready. School districts got Badger Exam results over the summer and shared individual student scores with teachers and parents at that time. But until Wednesday, when DPI released the data, districts could not share publicly their schoolwide and districtwide results. Consequently, districts did not know until Wednesday how they scored relative to other districts. Tim Schell, director of curriculum and instruction for the Waunakee School District, said his district will compare itself to numerous “benchmark districts” across the state, ones that are similar in size, demographics and per-student spending to Waunakee. “If we see that a district similar to us has much better results in, say, math with low-income students, we’ll look at what that district does,” he said. Like many district officials, Schell said he hopes for more stability and fewer surprises in future tests. “We’ve got a bit of a ‘Groundhog Day’ scenario going on,” he said, referring to the 1993 movie in which Bill Murray’s character repeats the same day over and over. “It was a steep learning curve with the Badger Exam, and it will be another steep learning curve with the Forward Exam. For the first time in state history, all public high school juniors had the opportunity to take the ACT. The state picked up the cost — about $56 per student. With this new statewide ACT measure, there is potential for confusion, as there now will be two differing ACT numbers released each year. Historically, ACT results have been released annually for all public and private school graduates who took the test during their high school career. For last year’s graduating class, the composite score was 22.2. That score represents about 73 percent of all graduating seniors, whereas this new measure represents almost all high school juniors. For that reason and others, comparing the two numbers would be misleading, DPI officials say. In addition to reporting the composite ACT score for all juniors Wednesday, DPI said it took an additional step and converted the scores into performance levels. 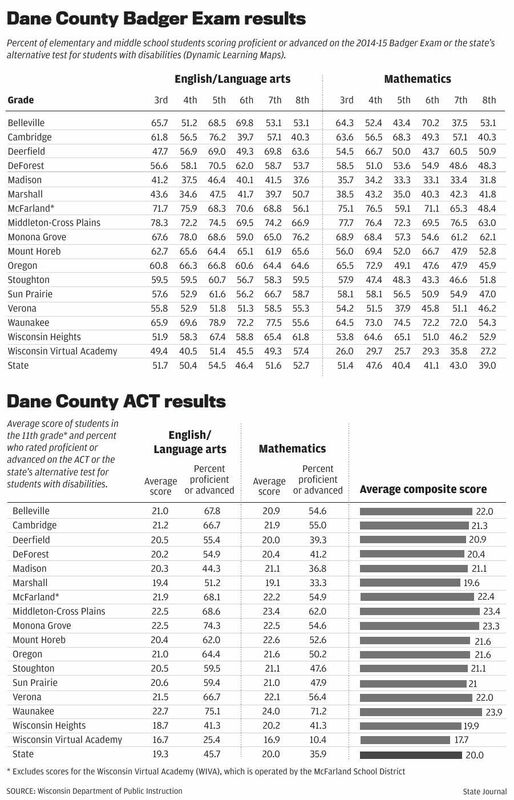 Those results show that 45.7 percent of juniors who took the ACT were proficient or advanced in English/language arts and 35.9 percent achieved at those levels in math. State Journal reporter Molly Beck contributed to this report. The test provider's bid for a 10-year contract is $63 million. The state is asking for $7.2 million more than originally estimated over the next three years to administer new Common Core-aligned tests. The case now goes to the School Board, which can accept, reverse or modify the recommendation. Dereian Brown is accused of bringing a BB gun to Cherokee Heights Middle School. Under the new standard, classes likely will be cancelled when the wind chill hits minus 25. New Glarus, Jefferson and Marshall are among 11 school districts in the state with referendum questions on the ballot. Hundreds of black male students look to benefit from mentoring, career advice and general support as a project to reduce truancy and increase graduation rates among that demographic was announced Wednesday. Sixty percent of eligible students in the statewide voucher system didn't take the Badger Exam in 2015. The issue affects middle school students who opted out of the Badger Exam last spring and are now taking high school-level courses this year while still in middle school. State's ACT score for juniors, also released Tuesday, showed a slight uptick.